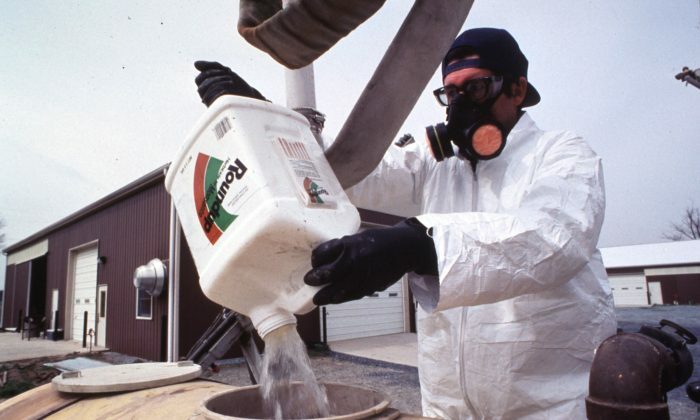 The Environmental Protection Agency (EPA) is expected to raise limits for residue levels of glyphosate—a key ingredient in the widely used herbicide Roundup, produced by seed and chemical giant Monsanto. Glyphosate is used primarily with genetically altered crops resistant to Roundup, but is also applied to roadsides for general weed maintenance. According to the U.S. Department of Agriculture’s (USDA) 2010 Agricultural Chemical Use Report, glyphosate spraying skyrocketed exponentially over the past decade, with the latest figures showing 180 million pounds to 185 million pounds of the chemical applied to U.S. soil annually. However, some scientists and health advocates insist it’s a dangerous poison. The new rule would allow forage (food for horses or cattle) and hay teff (teff is premium hay) to contain up to 100 ppm (parts per million) glyphosate, oilseed crops 40 ppm, root crops from 200 ppb to 6000 ppb, and fruits would range from 200 ppb to 500 ppb. Glyphosate’s toxicity is controversial. Monsanto scientists say the chemical is safe because it acts on a specific biochemical pathway for amino acid synthesis that is not present in animals. However, recent research shows that glyphosate may induce serious disease in human beings because the chemical interferes with gut bacteria, which can disrupt immunity and vitamin synthesis. While some studies link the chemical to diseases such as cancer and autism, the EPA only lists lung congestion and an increase in breathing rate as symptoms of acute glyphosate exposure. Public comments opposing the new regulations are due by July 1.